If you want to keep your vehicle in good working order, it's crucial that your exhaust system is operating properly. Whether your car has a stock or aftermarket exhaust system, the components help your car in more ways than you might think. The exhaust system reduces the amount of noise made by your engine, causing your driving experience to be more pleasant. It also controls the emissions released from the vehicle. Make sure your catalytic converter is operating properly and that there are no leaks in the exhaust system. 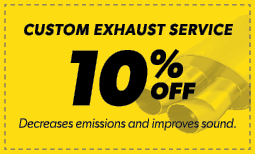 Contact Meineke #2235 in Raleigh, NC, to learn more about maintaining your current or investing in a custom exhaust system. 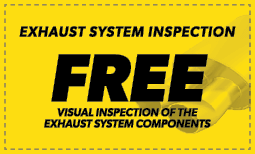 A question we are frequently asked at Meineke #2235 in Raleigh, NC, is: "When do custom exhaust systems need inspections?" If you're already asking this question, you probably need one. You might be noticing odd symptoms such as louder volume, stronger fumes, or a new vibration. These are all signs of leaks and failing catalytic converters. Even if you're not noticing any of these symptoms, your car's performance exhaust system should be inspected if it's over 8 years old. Ensure that your car is in the greatest shape it can be in. Investing in muffler repairs will increase your car's longevity before the problems get any worse. A common question we receive at Meineke #2235 in Raleigh, NC, is whether fuel efficiency is really affected by the exhaust system. The answer is yes. Your exhaust system should include an oxygen sensor. This sensor is designed to detect the amount of oxygen that is coming through the entire exhaust system. It sends a signal to your engine to either increase or decrease the amount of fuel it burns to maintain maximum efficiency. However, if the oxygen sensor is defective, it can cause your vehicle to expend unnecessary fuel. Having your oxygen sensor changed every 60,000 miles can help eliminate this issue before it begins. A catalytic converter is a commonly overlooked item on a car. This component is located inside of the exhaust pipes. It reacts chemically with spent fuel vapors that pass through it and completely burns away pollutants before they reach the outside air. Manufacturers are required to warranty these components for only 80,000 miles. While necessary, catalytic converters also restrict the efficient flow of air through an engine, which can minimally reduce the power output. High performance exhaust systems overcome this limitation, and many aftermarket exhaust components enhance the original design. Replacing worn out catalytic converters and installing custom exhaust systems are complicated jobs. Contact our in Raleigh, NC, to see what we can do to improve or repair your vehicle. If you want the best performance exhaust system possible for your vehicle, don’t look any further than Meineke #2235. We carry many kinds of performance exhaust systems for cars, no matter what their make or model is. Our technicians are committed to providing you with the most expeditious and affordable aftermarket exhaust services possible. Whether you are upgrading to a high performance exhaust or getting some muffler repairs done, we’ll do everything possible to keep your muffler repair cost low. Stop by one of our many convenient locations in Raleigh, NC.